There is considerable evidence that the translation rate of major basic science promises to clinical applications has been inefficient and disappointing. The deficiencies of translational science have often been proposed as an explanation for this failure. An alternative explanation is that until recently basic science advances have made oversimplified assumptions that have not matched the true etiological complexity of most common diseases; while clinical science has suffered from poor research practices, overt biases and conflicts of interest. The advent of molecular medicine and the recasting of clinical science along the principles of evidence-based medicine provide a better environment where translational research may now materialize its goals. At the same time, priority issues need to be addressed in order to exploit the new opportunities. Translational research should focus on diseases with global impact, if true progress is to be made against human suffering. The health outcomes of interest for translational efforts need to be carefully defined and a balance must be struck between the subjective needs of healthcare consumers and objective health outcomes. Development of more simple, practical and safer interventions may be as important a target for translational research as the development of cures for diseases where no effective interventions are available at all. Moreover, while the role of the industry is catalytic in translating research advances to licensed interventions, academic independence needs to be sustained and strengthened at a global level. Conflicts of interest may stifle translational research efforts internationally. The profit motive is unlikely to be sufficient alone to advance biomedical research towards genuine progress. The status of translational research has drawn increasing attention recently in top biomedical journals [1–5] and in the policy making of the NIH, as reflected also in the NIH Roadmap . Translational medicine encompasses all the disciplines that intervene in moving scientific progress from the bench to the bedside and in conveying stimulating information from the bedside back to the bench . While basic sciences are conceived as having made amazing leaps forward, this progress has not resulted in many major cures . At the other end, clinicians are considered too unfamiliar with the capacities of modern science to bring fruitful questions to the attention of basic scientists . Nevertheless, recent evolutions in basic and clinical science have created a new window of opportunity for the growth of translational medicine. The aim of this commentary is to discuss why translational efforts might have failed to-date, how this new opportunity may be best exploited, and some remaining obstacles that must be overcome. My team recently examined the rate of translation of promising basic research findings to clinical applications . We screened reports published between 1979–1983 in 6 top basic science journals (Science, Nature, Cell, Journal of Biological Chemistry, Journal of Experimental Medicine, and Journal of Clinical Investigation). We found 101 articles that clearly made a promise for a major clinical application of their findings. Two decades later, only 5 of these promises were in licensed clinical use and only one of them had a major impact on current medical practice. Three quarters of the basic science promises had not yet been tested in a randomized trial. The strongest predictor of moving to randomized experimentation was industry involvement in the original basic science publication. In the absence of such involvement, scientists could not see their findings materialize (figure 1). Since the analyzed publications represented very early stage basic research, this suggests that the industry is willing to develop mostly research paths where it has been involved from the very early basic science start, rather than pick up the lines of basic research that have been developed independently, often with highly competitive government support. 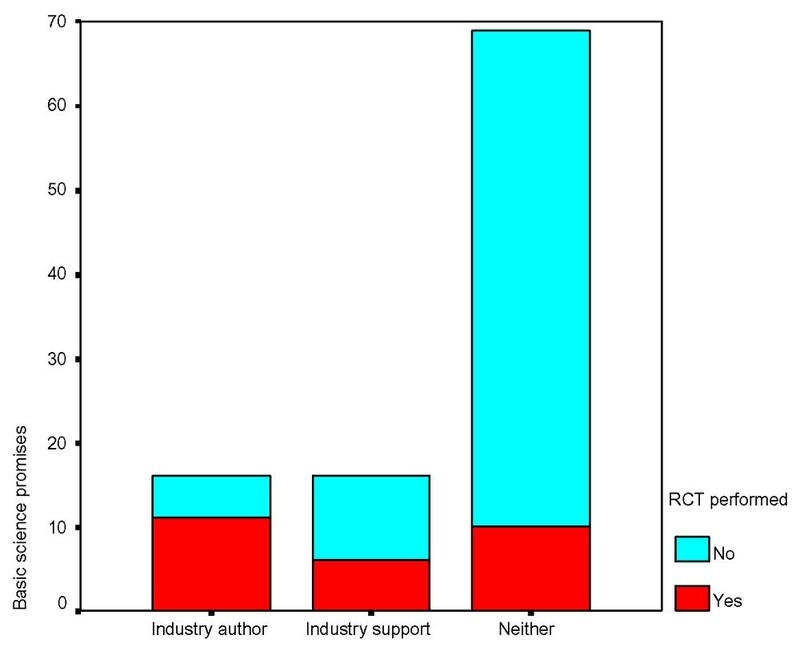 Translation of basic science promises after two decades: number of promises resulting or not in at least one randomized controlled trial (RCT) according to whether an industry author was involved in the original basic science publication, the industry was involved in some other way (offering acknowledged financial support or providing the technology under testing), or there was no acknowledged industry involvement at all. Data are from ref . Many investigators might interpret these results as evidence that translational medicine has failed to match basic science advances. Clinical research would also be absolved for this failure, since clinical research methods (clinical trials in particular) are considered as being well established for many decades. The first randomized clinical trial was published 56 years ago. However, a different interpretation is possible: perhaps basic science had often been immature in its claims even in the recent past, while clinical science had often been unfocused, biased, of poor scientific standards, and driven by priorities not congruent with the true health needs of humankind. Basic science advances in the last few years have indicated that most common diseases entail extremely complex patterns of pathogenesis, involving the regulation of dozens and hundreds of genes and their protein products. In the light of advances in genomics, proteomics, and bioinformatics, basic science of the 1980s and 1990s where single or few pathways were investigated would currently seem naïve at best. We don't know yet whether the molecular medicine of the early 21st century may seem equally oversimplified even within a decade or two. The complex new patterns of disease etiology and regulation still pose considerable problems of validation and testing of generalizability [9, 10]. The role of environmental parameters and their interactions at the molecular level with intrinsic factors is yet largely unknown. These interactions may prove to be even more formidable at disentangling. It is probably premature to believe that all human diseases will be erased by the year 2050, as was claimed recently . The intractability of several chronic diseases, the unpredictable emergence of new diseases such as AIDS, SARS, and mad cow disease and the equally unpredictable re-emergence of old diseases such as tuberculosis makes such a target an utopia. Nevertheless, provided that we approximate the depth of the complexity of the molecular issues involved, translational medicine may have indeed a more solid starting point now in its efforts. Clinical research has been even more revolutionized in the last decade, in particular with the advent of evidence-based medicine. It is now acknowledged that a large corpus of clinical information that has haunted the top medical textbooks and experts' opinions was wrong, outdated, and/or dangerous for human health . Evidence-based medicine has placed emphasis on robust scientific principles, the dissection of strengths and limitations of various clinical research designs, and the identification of bias in medical research . We are now aware that serious errors may underpin much of clinical research, and even randomized trials may succumb to biases . Moreover, clinical scientists have now tried to systematize their knowledge base. Efforts such as the Cochrane Collaboration [15, 16], an international coalition that aims to generate systematic reviews on all aspects of health care, has been hailed as equivalent in scope to the Human Genome Project . Such systematic efforts can tell us reliably for each disease and condition whether we have enough evidence for its effective management, and whether this evidence is biased or not. Furthermore, rigorous approaches have been recently developed to quantify the burden of disease for various conditions . It is thus becoming evident that for several trivial issues, there is often a waste variety of expensive treatments, while for many serious conditions there is no effective intervention at all and little research is targeted at them [19, 20]. With genuine progress in the basic and clinical sciences, translational efforts have a better chance of being successful. Even under these circumstances though, the question remains on who will do this research and where it will be done. A very large portion of all current research is done in the USA. Scientific papers with US authorship attract approximately half of all citations in the Web of Science (over 30 million citations in the last decade alone, followed by England with less than 6 million) . A handful of developed countries make up another 40–45% of the total citations. NIH is by far the greatest governmental funding body for biomedical research globally. However the USA, with 4% of the total global population, carry a negligible portion of the global burden of disease . Several health targets that may seem important to the US population may be of second-rate importance for global health. Hopefully, different diseases that have been traditionally categorized under different organ systems and under different NIH institutes may share common pathogenesis principles and may warrant similar approaches to their understanding and management. The recognition of the importance of these cross-links in the NIH policy  creates hope for "collateral" gains in medical progress against diverse diseases. Broad-spectrum advances may be exploited for the opportunistic targeting of diseases besides the original targets that concern affluent societies. Of course, the eventual translation of basic science leads will probably continue to be disease oriented and aimed at "the benefit of our people", as the NIH Roadmap editorial in Science states . However, "our people" in fact is "humanity at large". It may be argued that the basic science investment of the US is probably one of the most prominent components of foreign and domestic aid that the leading country can offer to the rest of the world. However, like much other aid that is wasted, it is unclear whether that research investment is used efficiently for the rest of the world. Many clinicians, in particular those working in tertiary care, feel increasingly that medicine in the USA and other developed countries has lost much of its focus and is mostly preoccupied with highly expensive trivia of tangential relationship with the true quality and dignity of human life. What do we really wish to achieve with healthcare? This is a prime question to answer, to decide where one should direct translational efforts. It is encouraging that the NIH Roadmap discusses, under translational research issues, the assessment of clinical outcomes and the need to develop more sensitive and well-validated tools to improve outcome measurements . It is also anticipated that research should be directed to therapies that would be most highly valued by patients . The emancipation of patients from paternalistic physician control in valuing health preferences is important. However, we also have to strike a balance between subjective needs and objective facts. For example, it is pitiful that for many treatments, the collection of information has traditionally focused more on efficacy than on toxicity. For diseases where treatments are already available, a major role for translational efforts may be to generate safer interventions. However, how is this to be achieved when objective data on adverse events are not even properly reported in the scientific literature ? Even when collected, such data are often rapidly lost and unavailable for further comparative study . Moreover, subjective needs are important, but their subjectivity has to be reckoned seriously. In health interviews in Ghana, a large proportion of serious medical problems that were subsequently obvious upon physical examination were not considered enough of a problem to even mention to interviewers . Conversely, in affluent societies marketing and advertising forces may manipulate and generate trivial subjective needs. This may be enhanced through up-scaled direct-to-consumer advertising . Subjective needs pertain not only to treatments, but also to other health technology advertised as essential for prevention or self-knowledge of health risks, e.g. population genomic testing . New health products in such societies may have weird elasticity features. For most goods, more expensive pricing leads to lower consumption. In modern medicine, this is often reversed. The more expensive or convoluted a product is, the more aggressively it may be sought, even when the benefit is questionable. For example, the introduction of new, expensive broad-spectrum drugs has led to increasing expenses for out-of-hospital antibiotics, as these expensive agents are over-prescribed despite lacking genuine indications . Another common misconception about translational medicine is that it always has to deal with diseases that are not only complex, but also represent key preoccupations of cutting-edge basic research. Many diseases are very important in terms of costing human lives and quality of life, but nevertheless they have not been prime targets for high-profile basic science . Many patients suffer worldwide from injuries, war, malnutrition, and untreated infectious diseases. For many of these conditions, high tech molecular science may not be the prime approach to address them. Still, translational research is needed and should focus on finding practical solutions for their prevention and treatment. Even for diseases where currently treatment is available, e.g. HIV/AIDS, such treatment is of no use, if it cannot reach effectively even 5% of the patients who need it . Translational research has a prime role here. While such "access" problems usually have their roots in political and financial setbacks, it may be erroneous to wait for these deficiencies to be corrected worldwide. Translational efforts could aim at developing treatments and modes of delivery thereof that would make wide implementation feasible, even if the political and financial circumstances were far from ideal. Improving human health worldwide may actually be an efficient strategy even for correcting financial deficiencies. Translational research itself is increasingly prioritized by financial motives. The private sector has become more important than government in biomedicine (figure 2). A large component of translational activities are conducted for the industry, either by the industry itself or by academia and other research centers. The industry also funnels a lot of its funding to non-academic contract-research organizations who have emerged as competitors to academic centers. Relationships between the industry and academia are continuously reappraised, but the association is certainly not a completely smooth one [30–32]. Conflicts of interest, demise of scientific independence, and the subordination of scientific quality to profit seeking are the main problems that may arise in this tenuous partnership. 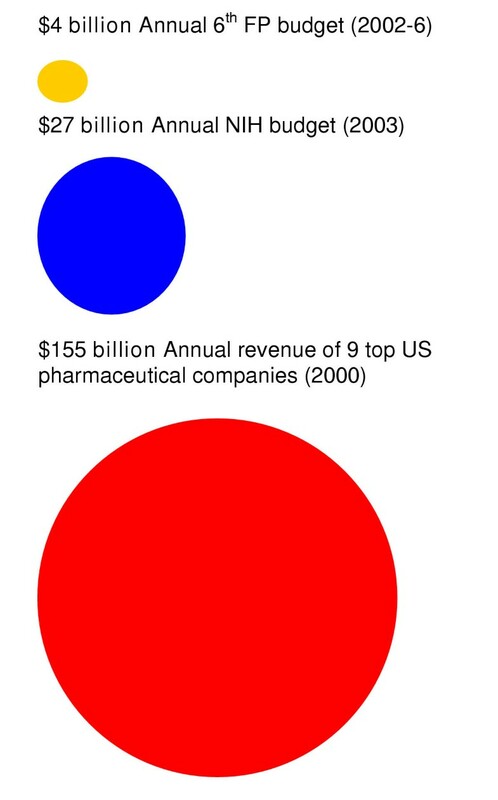 Research players at large-scale: research budget of the European Commission (6th Framework Programme [FP]) and the NIH as compared with the revenue of large pharmaceutical companies. On the one hand, it should be clearly acknowledged that the profit motive has been the driving force behind many important discoveries in healthcare. Under healthy scientific and regulatory environments, relationships with the industry can be enhancing to the academic and scientific mission and can yield valuable products for developed countries. For less developed countries, the profit motive needs to be modulated to achieve some benefits . Conversely, the industry can have crushing effects on investigators even in strong academic institutions such as well-publicized cases from UCSF and the University of Toronto prove [34, 35]. The average European academic institution, let alone institutions in the developing world, may not be able to withstand corporate pressure. Tenuous funding from central sources and poor and non-transparent peer-review systems, along with variable degrees of academic and administrative corruption, create a setting that leaves little room for genuine resistance against industry advances. Burdensome administrative directives such as the recently proposed European Directive on Clinical Trials may inadvertently inhibit clinical research that is independent of the industry. Already the academic establishment at many countries is actively supported by the industry as a peculiar star system that primarily advertises and promotes its products. Tons of low-quality scientific meetings publicize pseudo-translational research according to industrial priorities. Conflicts of interest are often difficult to probe and under-reported even in the US . It is thus not surprising that in economical analyses in oncology, only 5% of company-sponsored studies have found that interventions are not cost-effective, as compared with 38% of not-for-profit sponsored studies . When it comes to the countries with less strong research tradition, the massacre of academic freedom may be unconditional. Recently, a professor of pharmacology from a Balkan country visited my university. I was surprised to find out that his team had conducted over a hundred phase I studies under the auspices of the industry. The results are rarely published of course, unless the sponsors wish so. The delay in the publication or even lack of publication of "negative" results has been shown even for NIH-sponsored, large, efficacy randomized trials . Publication bias against "negative" results may be the rule rather than the exception worldwide when it comes to phase I experimentation  or basic science efforts. As regulatory rules for translational and clinical research become stricter, but not necessarily better, in a few "advanced" countries, much translational research may be conducted at an opportunity cost in non-transparent settings. The picture emerging from the world scientific literature may be a highly distorted one. The availability of electronic publication should help the unimpeded dissemination of "negative" research findings, since space limitation is no longer an issue as in printed journals. Moreover, there is a need to reverse the mentality that "negative" findings represent worse research than "positive" findings. Research effort should be respected on the basis of the rigorousness of its design, hypotheses, and execution, and not on the basis of its results. The nature of the results will unavoidably be used to guide the further applicability of research, but it should not be used to judge also its scientific merit. Lack of dissemination of "negative" findings may also lead to a waste of investing resources on researching again and again pathways that would otherwise have been known to be unproductive, if the "negative" results of prior investigators had become widely available. As basic and clinical sciences mature, translational research has a chance of making an important difference for human health. However, priorities need to be selected with broad horizons in mind. A global perspective should be assumed not only in priority setting, but also on the conduct of research. Universal guidelines that are consistent with the realities of the 21st century biotechnology industry and academic science should be adopted. The rules should be clear and they should reward creativity, maximize transparency, and exploit local strengths, not stifle progress with irrelevant administrative burdens. The inability to create a truly international scientific society with high standards, transparent processes, and academic independence may create a poorer world for all of us.